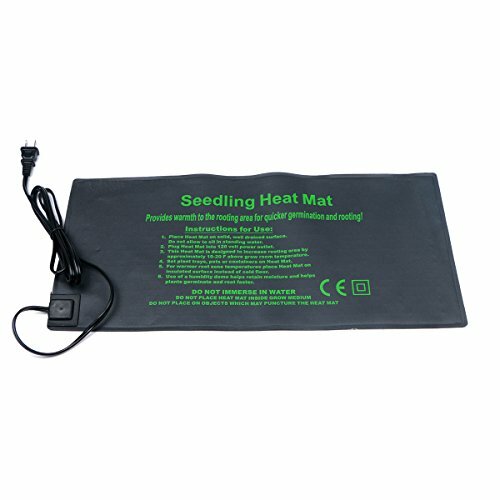 Seedling Heat Mat- Seed Starting Heat Mat for Germination, 10''x20'' Propagation Seed Heat Starter Mat, Germination Warming Mat, a U.S. Solid Product by U.S. Solid at Halo Grow Box. Hurry! Limited time offer. Offer valid only while supplies last. Sometimes seeds need a little more time to grow than from the last frost to the end of the season. Seeds need to be at a certain temperature to grow. Sometimes seeds need a little more time to grow than from the last frost to the end of the season. Seeds need to be at a certain temperature to grow. Especially in the colder parts of the world, you won't reach the right temperature until well into the season. With a seedling heat mat, you can start your seeds inside before the last frost. To start your seeds inside, you will need a plant tray, a heat mat, potting soil, and of course, seeds. Start putting potting soil inside of your plant tray and plant your seeds. Be sure to place two or three seeds in each hole because some seeds will not germinate. Lightly water your seeds and plug in your seedling heat mat. Place the plant tray on top of the heat mat. Keep the heat mat on all night to keep your seeds at a consistent temperature. In 10 to 14 days you should start seeing some progress. The U.S. Solid Heat Mat will allow you to start your seeds inside so you have great looking plants by the end of the season.